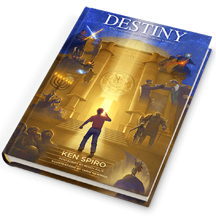 Includes an autographed copy of Ken's new book, Destiny- Why a Tiny Nation Plays Such a Huge Role in History, and a ticket to his talk afterwards. Rabbi Ken Spiro - author, tour guide, historian, and lecturer - has appeared on radio and TV programs such as BBC, National Geographic, The Discovery Channel, The History Channel, Channel 4 England and Arutz Sheva-Israel National Radio. He is the author of WorldPerfect – The Jewish Impact on Civilization, Crash Course in Jewish History, and Destiny – Why a Tiny Nation Plays Such a Huge Role in History. His writings and seminars can be accessed on www.kenspiro.com and www.aish.com. Rabbi Spiro, originally from NY, has lived in Israel since 1982. He served in a combat infantry unit in the IDF. A father of five children, he currently lives in Jerusalem.